At 270,000 acres, Tejon Ranch is the biggest chunk of undeveloped private land left in California. Tejon Ranch is California wild, a place where mountain lions prey on unsuspecting fawns and storm-twisted trees cling to remote ridges, where California condors soar over bald peaks and Tehachapi slender salamanders hide in the damp leaf litter of secluded canyons. 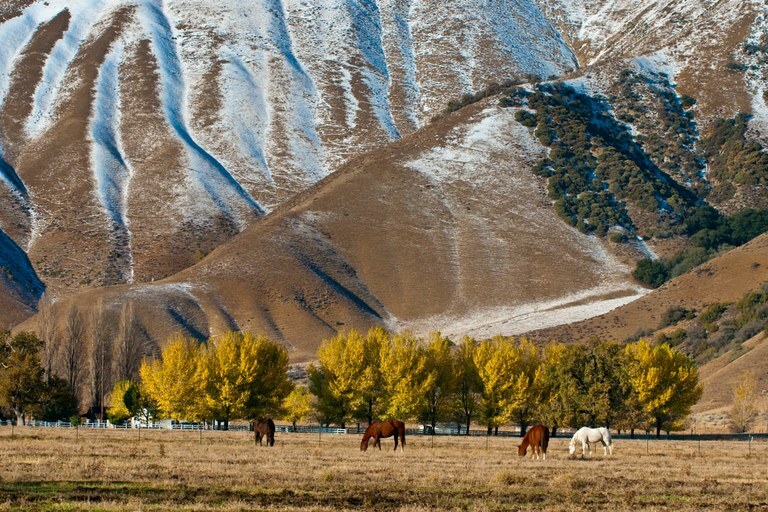 Tejon is also a private working ranch, where cowboys run cattle across an area bigger than Rocky Mountain National Park. Los Angeles, the nation’s second-largest city, is a mere 70 miles to the south. This raw landscape is the heart of a controversial agreement designed to conserve the biggest chunk of undeveloped private land left in California. But now, the environmentalists who brokered the deal are staring at the payback: three large housing projects totaling 34,780 houses on 30,000 acres. Hailed a decade ago as the conservation deal of the century, the Tejon easement is testing whether agreements between conservationists and private landowners can protect enough habitat to justify the trade-offs. The historic cattle ranch — owned by Tejon Ranch Company, an agribusiness listed on the New York Stock Exchange — lies at the convergence of four distinct ecological regions. The Sierra Nevada meets the Tehachapi Mountains, joining the San Joaquin Valley on the northwest flank of the ranch, and the Mojave Desert on the southeast. Tejon is one of 25 hotspots worldwide recognized by the nonprofit Conservation International for its rich biodiversity, which includes endangered Bakersfield cactus and blunt-nosed leopard lizards. It is also a key wildlife corridor, the last remaining link between the grasslands on the western and eastern edges of the San Joaquin Valley. For decades, as development overran grasslands and oak savannahs, Joshua trees and alpine forests throughout the West, California conservation organizations eyed Tejon’s distinctive mix of habitats. The surest way to protect sensitive landscapes is to own them, but Tejon’s 270,000 acres were not for sale. Instead, environmentalists and ranch owners negotiated a compromise in 2008. The conservation agreement protected 90 percent of the ranch: 240,000 acres, an area larger than Washington’s Mount Rainier National Park. No development will be permitted on these lands, which harbor a dizzying variety of species found nowhere else on the planet. In exchange, the five conservation organizations involved — the Natural Resources Defense Council, Audubon California, Sierra Club, Endangered Habitats League, and Planning and Conservation League — agreed not to oppose housing development on the remaining 10 percent. The Tejon Ranchwide Agreement was widely lauded as a landmark transaction that avoids prolonged parcel-by-parcel litigation. 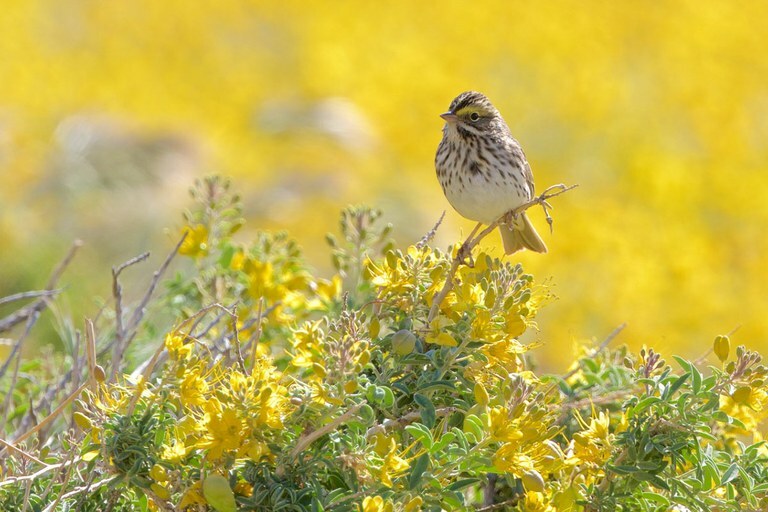 A Savannah sparrow during an April bloom at Tejon Ranch. Like thousands of other conservation agreements made with private landowners from Montana to New Mexico, this one balanced competing goals. It safeguarded the grassy dens of San Joaquin kit foxes and the deep isolation of pine forests, where sooty grouse might nest. And it offered surety for the ranch owners, said Barry Zoeller, vice president of corporate communications and investor relations for Tejon Ranch: They know exactly which areas are available for development and which are not. “Both sides had to swallow hard before striking this deal, but both came away with results they never could have secured any other way,” said Graham Chisholm, then executive director of Audubon California. But for both sides, the deal was fraught. There’s no guarantee that other organizations won’t sue the landowners to stop development. The process remains no “less subject to litigation,” Zoeller said. Development plans range from single-family homes within walking distance of schools and shopping, to “an upscale retreat” with “exceptional resort facilities.” Some development will be in Los Angeles County’s largest remaining grassland, some in critical condor habitat. For the conservation groups, agreeing to housing on 30,000 acres was a painful concession that has forced them to remain silent, while officials in Los Angeles and Kern counties have systematically approved plans for the Grapevine project just southeast of Bakersfield, and Tejon Mountain Village on a ridge where condors roost. In December, Los Angeles County officials approved the 19,300-house Centennial Project on ranch grasslands at high risk of fire. Centennial incited particular anger over increased traffic, air pollution and fire danger. Critics argue that Tejon’s biodiversity could have been safeguarded under existing state and federal laws, such as the Endangered Species Act, without sacrificing habitat for housing — indeed, that Tejon is a Faustian bargain offering little in exchange for more development. Half the land ranch owners offered for conservation is too steep and remote to be buildable, and regulations protecting endangered species would have required preservation of the rest, said Ileene Anderson, senior scientist with the Center for Biological Diversity. “Much of the same land could have been protected without environmental groups signing away their freedom to protest environmentally problematic developments,” Anderson said. Negotiating conservation agreements always involves compromises, said Joel Reynolds, Western director of the Natural Resources Defense Council. He saw Tejon as a now-or-never opportunity: “One of the most challenging aspects of my professional career is knowing when to strike a deal and when not to,” he said. Tejon Ranch supports many birds, including endangered California condors, willow flycatchers and spotted owls. 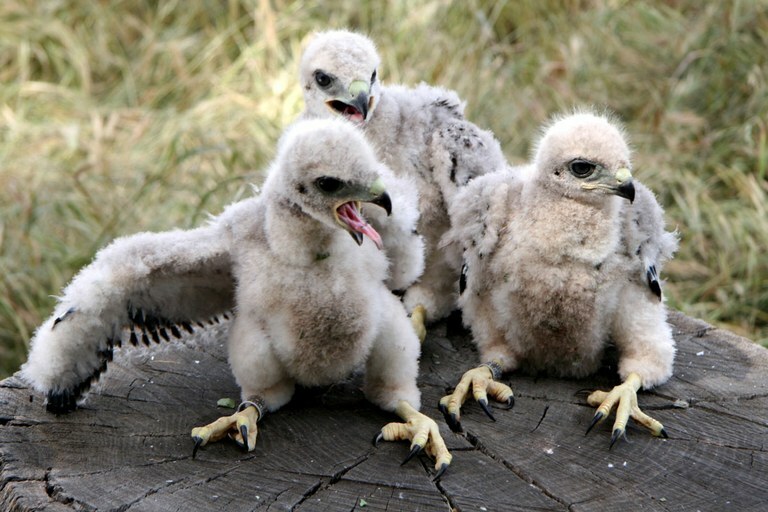 These red-tailed hawk chicks are among the ranch's healthy population of raptors. The conservancy was designed to facilitate access to the ranch for scientists and the public, both historically excluded by owners who feared rare species discoveries that might compromise their management plans. Botanists, ornithologists and herpetologists welcomed the opportunity to inventory Tejon’s wealth of known species and document new ones. In the decade since the agreement went into place, conservancy scientists have added about 200 new taxa to the ranch’s list. 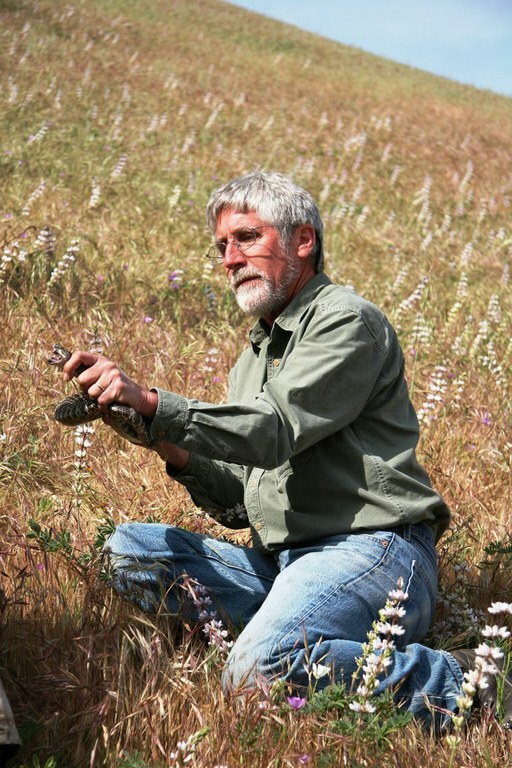 Pete Bloom, a raptor specialist who has conducted scientific surveys on Tejon Ranch, spends a moment with a rattlesnake. Although the conservancy was mandated by the Tejon agreement, funding for its management responsibilities was not. Future funding was tied to the sale of houses in Tejon’s development projects. The 2008 stock market crash left the conservancy facing “a financial cliff” after 2021, Reynolds said, and left ranch owners on the hook for funding from a source that has yet to materialize. TEN YEARS ON, the Tejon agreement has not reached “the level of progress I think all of us had aspired to achieve,” said Reynolds. That’s not surprising: Conservation agreements that don’t transfer land ownership can never be completely satisfying to the environmental groups negotiating them, said Kim Delfino, California program director for Defenders of Wildlife, a nonprofit conservation organization not involved in the Tejon agreement. “You want to hit a home run every time you get up to bat. Sometimes you hit a triple, sometimes a single,” she said. Still, if easements guarantee protections in perpetuity, “they often make more sense than rolling the dice in the courts,” she said. The Center for Biological Diversity is willing to take its chances. An original participant in talks with Tejon’s owners, the center pulled out of the 2008 deal. Today, it’s one of the plan’s most vocal opponents, using state and federal regulations to seek limits on development. “Those lands are incredibly steep and remote, and the notion of ever having the ability to build in those areas is equally remote,” said the center’s Anderson. Few have weighed the compromises of the Tejon agreement more carefully than Reynolds. Among the challenges unforeseen in 2008 was the ongoing effort it has taken to implement it. Key ranch partners have left and leadership has changed, requiring “education and negotiation” beyond what he expected, Reynolds said. “You can write the most careful agreement humanly possible, and yet things that you haven’t been able to anticipate will complicate the vision,” he said.